Social interaction is an essential element in roleplaying games. Adding relationships and dialogue to tactical wargames is what created roleplaying! 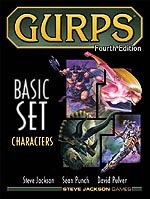 GURPS has always included rules for social standing and character interaction. Now players and GMs looking for more detail will have a place to find it. GURPS Social Engineering expands the basic rules on Status, reactions, Influence rolls, and many other topics, as GURPS Martial Arts expanded the combat rules. It offers new options for defining social backgrounds; portraying adventurers' dealings with other characters, organizations, and communities and societies; and managing the transition from negotiation to combat and back. This is a complete, detailed toolkit for defining the texture of adventurers' lives and alliances, playing a "face" character, or running an entire campaign about politics or personal relationships. Because this is a very detailed body of new rules, it needs a comprehensive playtest. Preference will be given to playtesters who have run campaigns with lots of character interaction and dialogue -- mysteries, capers, politics, and romance are examples of such themes. Knowledge of psychology, organizational dynamics, politics, and similar subjects will be helpful, especially if it has a practical focus. Some spaces will be reserved for people new to playtesting, to help develop the playtester pool. The playtest is currently scheduled to run from December 3, 2010 to January 10, 2011. Prospective playtesters should e-mail William H. Stoddard with [playtest] in the subject. Include your preferred e-mail address for the closed playtest mailing list, your name as wish it to appear in the published book, your e23 login name, and a few words on why we should pick you: qualifications, experience, current gaming group(s), etc. Information about preferred submission formatting is in the forum post for this playtest call.